The fire started around 2:30 a.m. inside the Jet Sanitation Warehouse in Islandia. 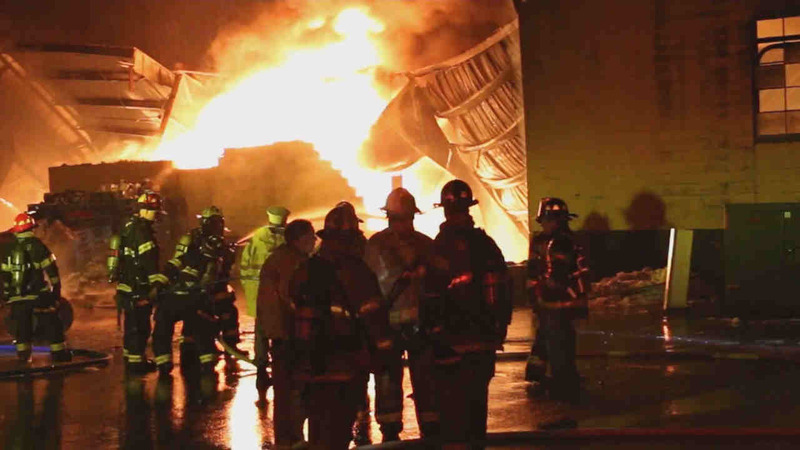 ISLANDIA, Long Island (WABC) -- Firefighters battled flames tearing through a sanitation warehouse in Suffolk County Wednesday morning. The fire started around 2:30 a.m. inside the warehouse in Islandia. The Jet Sanitation building on Blydenburg Road is likely filled with recyclables. Part of the building collapsed, as firefighters worked from the outside to get the flames under control. Islandia Mayor Allan M. Dorman said the village is working to coordinate the response to the fire. "The Village of Islandia is condemning the building, which will be demolished as soon as possible," he said in a statement. He said village fire marshal Mike Zaleski was working to determine the cause of the fire. Eastbound Veterans Memorial Highway closed between the Long Island Expressway and Sycamore Avenue in Islandia during firefighting efforts.